We are one of the leading organization for manufacturing and supplying excellent quality of 5 Litre Plastic Fuel Oil Measuring Jug With Flexible Spout. Like other Polylab Measuring Jugs, These jugs also , moulded in Polypropylene have excellent clarity as well as very good chemical resistance. The prominent feature of these jugs is the easy to read printed graduations. The rectangular handle provides significant advantage for easy pouring and handling. These jugs are autoclavable. Capacity: 500, 1000, 2000, 3000 & 5000 ml. 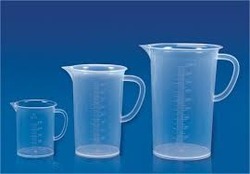 Measuring Jug : Measuring jugs having capacity of 250ml to 2000ml. 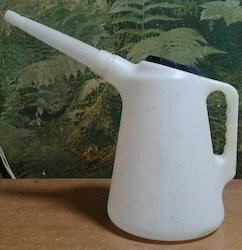 We can use Measuring Jugs for general lab work or for measuring out darkroom chemicals. These handy Jugs, moulded in Polypropylene, are clear, autoclavable and have good chemical resistance. These Jugs are provided with a handle for easy and convenient lifting and have raised graduations for easy reading. It is used in the laboratory, R&D depertment for measuring liquids.